Nolan Young is a self-described “military brat” born in Dothan, Alabama. She received her juris doctor degree from the Notre Dame Law School, and most recently worked as a private consultant on equity, diversity and inclusion issues for colleges, businesses and individuals. 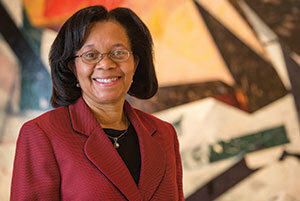 Previously she held positions in higher education, including director of institutional diversity and equity at Smith College and human resources director of North Shore Community College. Before the move to higher education, she held a variety of positions in Springfield, Massachusetts, where she was a practicing attorney, assistant district attorney and assistant city solicitor. Additionally, Nolan Young has created other learning opportunities, such as a recent conference, “Are You All INclusive?” which was co-sponsored by the Office of the Provost, Notre Dame Research and Foundation Relations. The conference addressed diversity and inclusion from the perspective of incorporating those elements into grant proposals. The event drew more than 65 participants. One point she makes is that the benefits of diversity and inclusion are not limited to people of color or other underrepresented groups. “Much data and research exist to indicate that diverse and inclusive classrooms, offices, faculty and co-workers lead to better results,” she said. Originally published by Carol C. Bradley at news.nd.edu on January 26, 2017.